A black and white flag, Coat of Arms, Mayor's chain, some else's chain are on a long page. 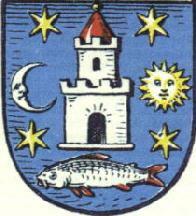 Bolków is in Jawor county, Dolnośląskie voivodship. It was in German Bolkenhain, with a huge castle, which is now a museum. On Ralf Hartemink's pages I found two Bolkow-Coat of Arms, different from each other and from the one on the URL above. I have used the colors of one of Ralf's to come up with this image. The blue bottom-stripe is shear guesswork. Bolków City and Commune; voj. Dolnośląskie; Jawor County - I giffed the variant without faces in the moon and in the sun.